WARNING: Despite having a plastic shield, the heat sink assembly may be very hot during normal operation. Be sure that it has had sufficient time to cool before you touch it. 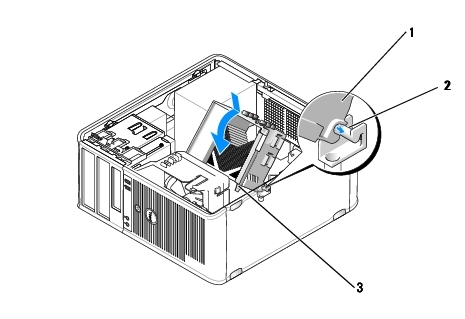 Loosen the captive screws on each side of the heat sink assembly. CAUTION: Unless a new heat sink assembly is required for the new processor, reuse the original heat sink assembly when you replace the processor. 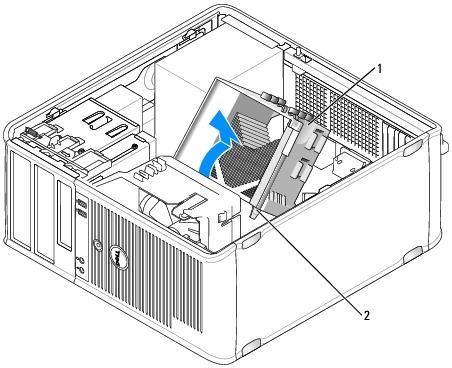 Open the processor cover by sliding the release lever from under the center cover latch on the socket. Then, pull the lever back to release the processor. 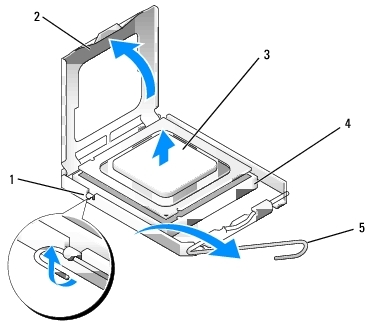 NOTE: You must position the processor correctly in the socket to avoid permanent damage to the processor and the computer when you turn on the computer. When the processor is fully seated in the socket, close the processor cover. 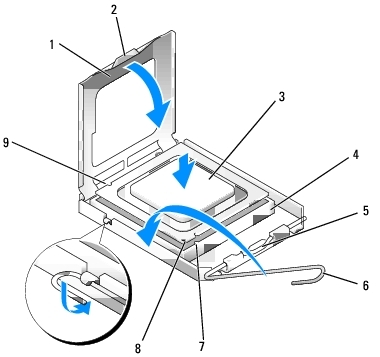 Ensure that the tab on the processor cover is positioned underneath the center cover latch on the socket. Pivot the socket release lever back toward the socket, and snap it into place to secure the processor. Place the heat sink assembly back onto the heat-sink assembly bracket. Rotate the heat sink assembly down towards the computer base and tighten the two captive screws. CAUTION: Ensure that the heat sink assembly is correctly seated and secure.